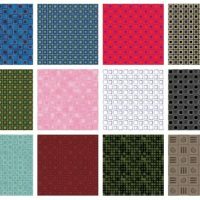 Pick a pattern design from one of these collections and instantly see it on hundreds of items you can personalize and purchase! We are just getting started so keep checking back as more pattern collections and product templates are added. 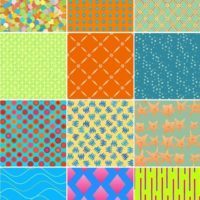 If you are looking for pattern graphics to download see the Seamless Pattern Tile category. 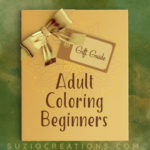 Also see our Zazzle Customizing Tips to help you get the most out of this feature. Pick a colorful Summer Splash pattern from a collection of 12 designs to generate a set of bright and colorful pattern gifts for summer that you can customize and make uniquely yours from Zazzle. 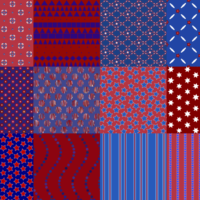 Pick an Americana stars and stripes pattern from a collection of 12 designs to generate a set of red, white, and blue patterned USA theme gifts you can customize and make uniquely yours from Zazzle. 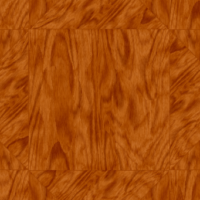 Pick a wood pattern from a collection of 24 styles and colors to generate a set of wood pattern gifts you can customize and make uniquely yours from Zazzle. 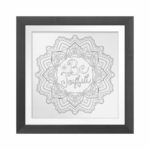 Pick a square pattern from a collection of 12 designs to generate a set of square pattern gifts you can customize and make uniquely yours from Zazzle. 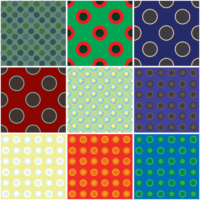 Pick a circle pattern from a collection of 32 designs to generate a set of circle pattern gifts you can customize and make uniquely yours from Zazzle.